Union County Democrats spent a pleasant Spring morning cleaning their adopted section of Highway Highway 82. A group of Democrats met in town and carpooled out to their assigned 2 ½ mile stretch of Highway 82, just past Pierce Lane to Market. All went well in spite of the rain. Nicole Foss Presents "A Century of Challenges"
Our friends at ORA, Grande Ronde Transition, and EOU Students in Free Enterpirse are bringing internationally renowned writer and speaker Nicole Foss to La Grande. Nicole will present "A Century of Challenges" at 7 pm on Sunday May 29 in Huber Auditorium at Badgley Hall on the EOU campus. Her lecture will focus on the economic dislocations stemming from Peak Oil and rapidly rising energy costs. Foss will also show that strong communities and localized, sustainable economies can answer the challenges posed by the end of cheap fossil fuels. Do you ever feel frustrated with politics as usual? Does it seem to you that the media pundits and Washington DC elites have lost touch with the concerns of everyday people? Do you sometimes think that the voices of common folks are drowned out by the big money of special interests? If so, you have an opportunity to do something about it! The Democratic Party of Oregon and Organizing for America are teaming up to host an intensive half-day training on community organizing and leadership skills. 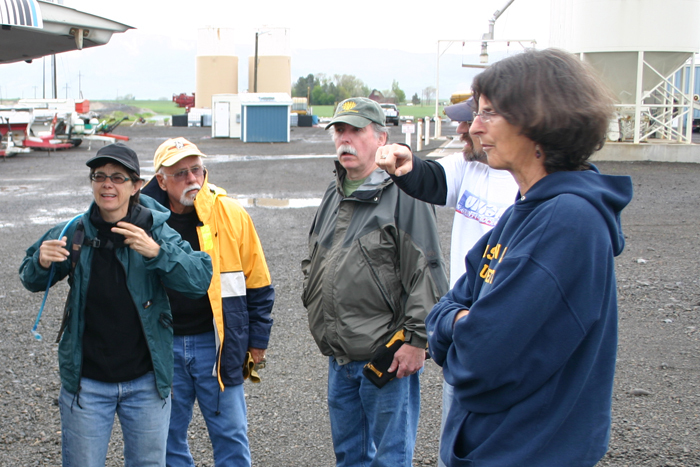 The training will be held on Saturday, May 7, from 10 am to 3 pm in Hoke Hall Room 301 at Eastern Oregon University. The training will cover everything you need to become an effective community leader, volunteer, and grassroots activist. The purpose is to empower people to organize in their own communities to better their lives and the lives of those around them. Topics include principles of organizing, building effective teams, tapping into social networks, recruiting and retaining active volunteers, crafting effective messages, and reaching out to other constituencies. Better still, the training is FREE! But space is limited and going fast. So please register now at http://bit.ly/EasternOregonTraining. For more information, please call Nikki Javurek at 503.546.0413. Or e-mail Glen Scheele at chair@union.oregondemocrats.org. The Affordable Care Act signed into law last year by President Obama has already delivered significant benefits. You can no longer be denied coverage due to pre-existing conditions, it bans the practice of rescission (dropping your coverage when you get sick), and it eliminates lifetime caps. These benefits are just a few that are already in force... more will come into play as additional facets of the law are phased in. But the ACA left in place the fundamental dynamic of a health care system delivered through private insurance plans. We know that private insurance companies absorb one out of every three dollars spent on health care in the US. So 30% of our health care spending goes to private insurers for overhead, underwriting, billing, sales and marketing... not to mention huge profits and exorbitant executive pay. By moving to single payer, those dollars can be recaptured to deliver quality health care for everyone. When the patchwork of policies and insurers is replaced, massive efficiencies can be gained. The bargaining power gained by such consolidation can bring real savings in health care delivery. Oregon Rural Action and Physicians for a National Health Care Program are sponsoring a free presentation and discussion on the benefits of single payer. Join the traveling Mad As Doctors on Tuesday, April 26th from 7 to 8:30 pm in the Mount Emily Room at the Grande Ronde Hospital at 900 Sunset Drive. For more information contact Bill Whitaker, bill@oregonrural.org, 541-805-5681. Or visit the PNHP website at www.pnhp.org. Spring has been wet and cold, but the trees are beginning to bud here in Cove. Soon the cherry orchards will be in bloom. Before long we'll see beekeepers trucking in their hives to insure the trees are pollinated and later bear fruit. Commercial honeybee operations pollinate crops that make up one out of every three bites of food on our tables. It is an industry that is responsible for producing apples, broccoli, watermelons, onions, cherries and a hundred other fruits and vegetables. But honeybees have been mysteriously disappearing across the planet, literally vanishing from their hives. Known as Colony Collapse Disorder, this phenomenon is a grave threat to our food supply and to our agricultural livelihood in Union County. 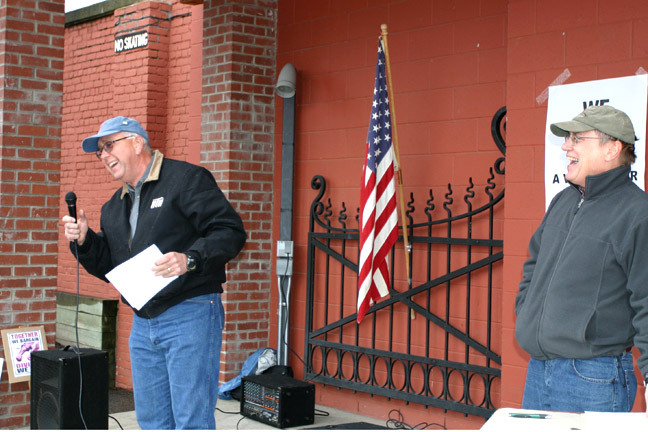 On MLK Day, April 4, 2011, Union County Democrats held a rally in support of collective bargaining. Democrats stood in the rain in solidarity with working people in Wisconsin, Ohio, Indiana and dozens of other states where well-funded, right-wing corporate politicians are trying to take away the very rights that Dr. King gave his life for. The news out of Wisconsin and dozens of other states has been disheartening lately. But the Republican attacks on workers and middle class families are plainly revealing their true motives. It is NOT about growing the economy, balancing budgets fairly, or creating family wage jobs. It’s all about payback and politics. It’s payback to their billionaire funders and corporate campaign donors. It’s the politics of division aimed at weakening the collective voices of millions of working and middle class families, students, youth, immigrants, and the jobless. People all across the country are awakening to this assault. Working people want to be a part of the solution. We want to work together to restore fairness, create good jobs, grow the middle class, and keep our communities storng and vibrant! I believe people all across the country are awakening to this assault. Working people want to be a part of the solution. We want to work together to restore fairness, create good jobs, grow the middle class, and keep our communities storng and vibrant! On April 4, 1968, Dr. Martin Luther King Jr. was assassinated in Memphis. He was there to stand with sanitation workers demanding their dream: the right to bargain collectively for a voice at work and a better life. On April 4, 2011, we are rallying together. We are standing in solidarity with working people in Wisconsin, Ohio, Indiana and dozens of other states where well-funded, right-wing corporate politicians are trying to take away the very rights that Dr. King gave his life for. March 25, 2011 marks the 100th anniversary of the tragic Triangle Shirtwaist Factory fire in New York City. The Triangle Fire remains one of the deadliest industrial accidents in US history. Most of the 146 victims were recent immigrant Jewish and Italian women aged sixteen to twenty-three. They perished in the fire or in desperate attempts to escape it. There were many factors that led to so many deaths. More than 500 people worked on the eight, ninth and tenth floors in the cramped factory building. There were no alarms -- workers learned of the fire after it was too late. A few buckets of water were on the factory floor -- no hoses, no extinguishers, no hope of fighting the flames. Exit doors swung inward, unable to open when the crush of panicked workers pressed against them. Managers routinely kept some doors to stairwells and exits locked to prevent theft. Two freight elevators became inoperable from fire damage after a few trips. A single exterior fire escape, warped by the heat of the fire, collapsed under the weight of people attempting to flee, plunging them to their deaths. When the fire department arrived, their tallest ladders could only reach six stories. Workers jumped to their deaths rather than be burned. But the tragedy spurred demand for change. Labor unions and reformers demanded and won workplace safety laws. Today, you can see the evidence of their efforts all around in public buildings and workplaces. You see clearly marked exits with wide doors that swing outward. Signs above doors that read "Must remain unlocked during business hours." Alarms, fire extinguishers, and sprinkler systems are all in evidence. Building and business owners must observe the posted maximum capacity in their operations. You'll see regular inspections for fire and safety hazards. The US Census was completed last year and the results published in February. The data show that Oregon has grown by 12% since 2000, adding nearly 410,000 new residents.